The creation of sophisticated, glittering, precious and semi-precious stones is a partnership between humans and the earth. Miners, lapidaries, designers, jewelers discover stones' allure, pull them from the earth or ocean, cut, shape, facet, polish and set them. Raw stones inspire us to do high-end makeovers, to reveal their beauty. Whether as rare as red diamonds or widespread as agate, these ancient fragments of the planet were born to tempt and please us. Stones are warm and patient, waiting for us to transform them into breathtaking adornment. To enhance our beauty. You know those gorgeous days when a crystal clear blue sky contrasts with puffy white clouds? I saw that in my mind's eye when I made this necklace. 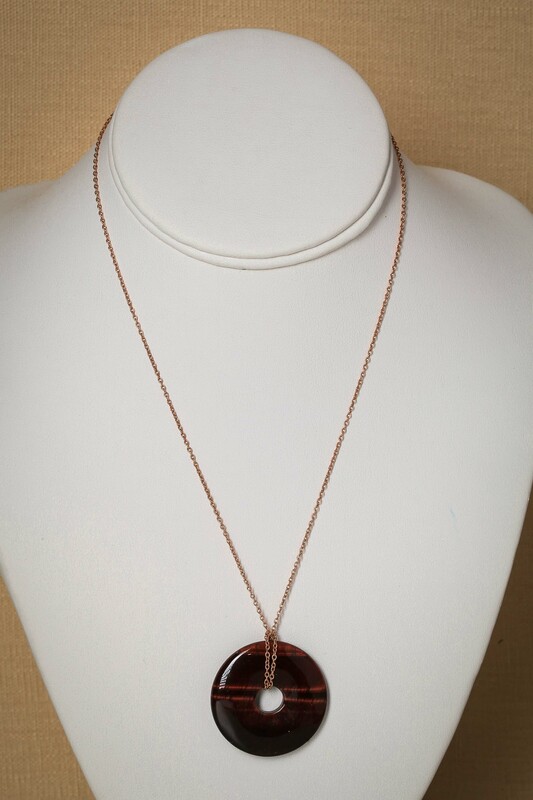 Wear this necklace to radiate the strength, power, and beauty of our planet. It attracts attention in a bustling city. Keishi pearls, iridescent and shaped like the most delicate shells, combined with baroque-shaped pearls in pale green, gold and sand. There's Swarovski in the color they call Light Colorado Topaz. Maybe I'll add a wee bit of pale lagoon blue or aqua to my next version of this. What do you think? Contact me at judith@judithglassman.com. The beauty of these garnets lies in their roughness. 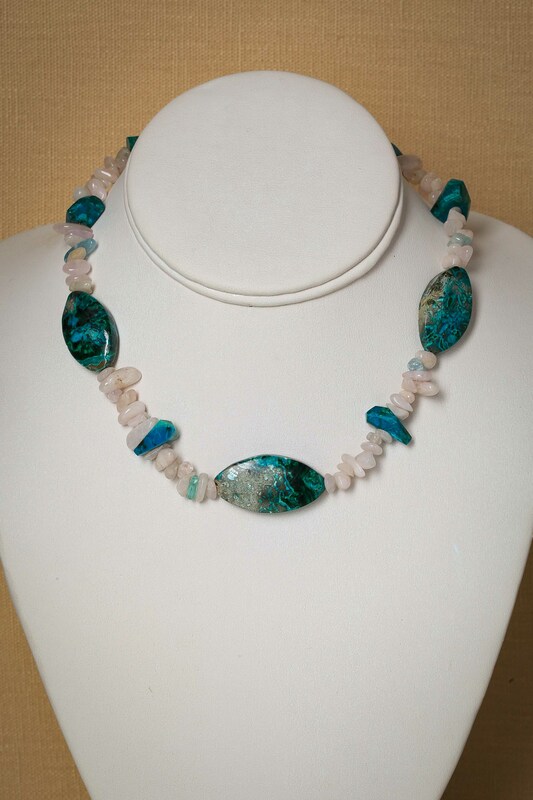 Every bead tells a story of the pressures of the earth over millenia. The stones are full of inclusions, flashes of light, and every once in a while an internal crack causes a startling rainbow. Unlike us, time and pressure make them more beautiful. 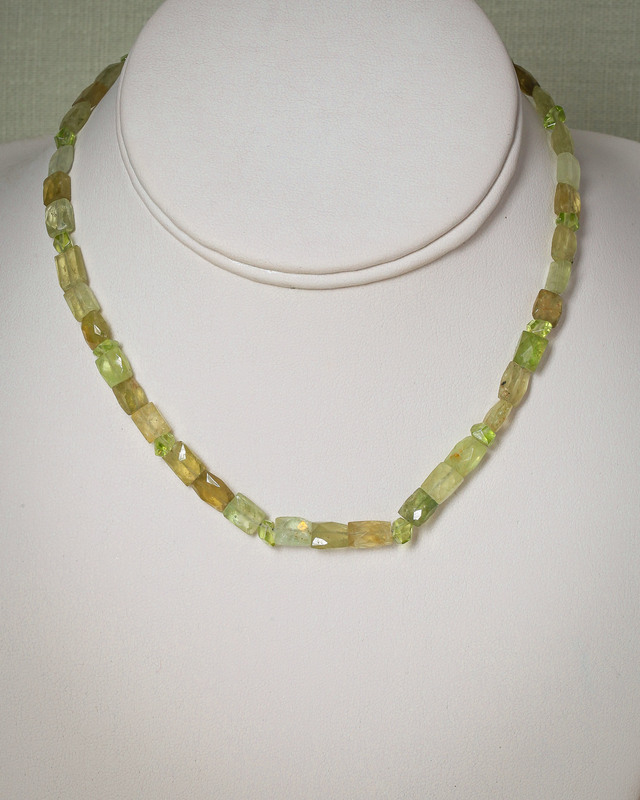 Glamorous peridot nuggets are scattered throughout. 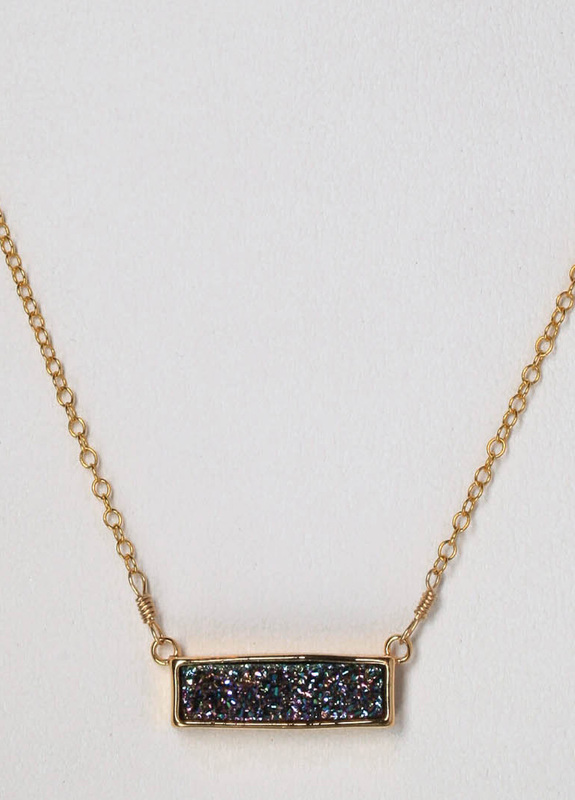 This gorgeous druzy's dark glitter depends on human intervention. First, to find, dig out, and split the geode - the rock that hides the sparkling crystals inside. Some geodes have color, many are white. Reliable, lasting color comes from a coating of titanium and heat. Worth the work! I fell for Imperial Jasper the first time I saw it. And I fell hard. So many colors, so many patterns, so many unique stones that took my breath away. Again and again that little hoarder voice in my head said, "Oh Wow! I have to keep this one!" Of course, my customers craved the very same ones I lusted after. I only have one neck, so they got the goods. You will get the ones you want as well. If you were holding this donut and tilting it back and forth, you would see the shimmering lines move across the surface. The same thing will happen when you wear it, every time you move. This property, called chatoyance, is mesmerizing and breathtaking. Your admirers will ask you, "Where did you get that stone?" Please tell them! What a stone! I can gasp at these babies for hours as I select the ones that want to play together. 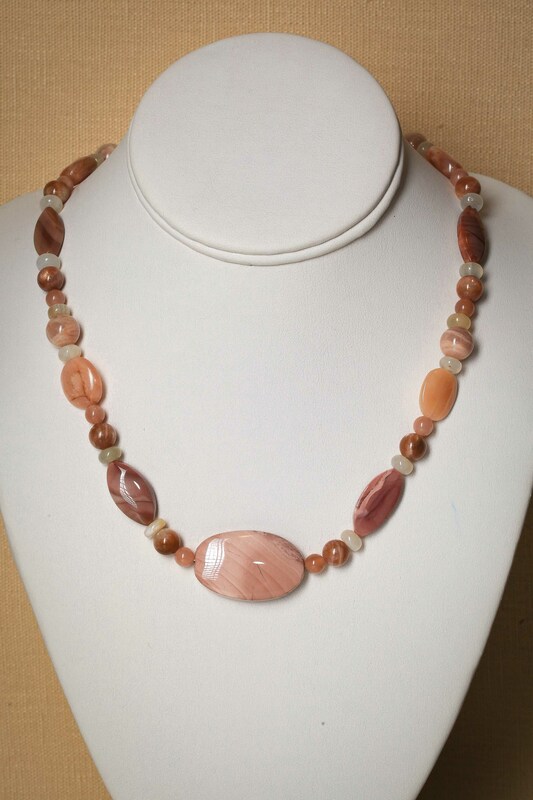 Highly polished, these agates sing with swirling patterns of vivid natural colors. They're so detailed they look handpainted. 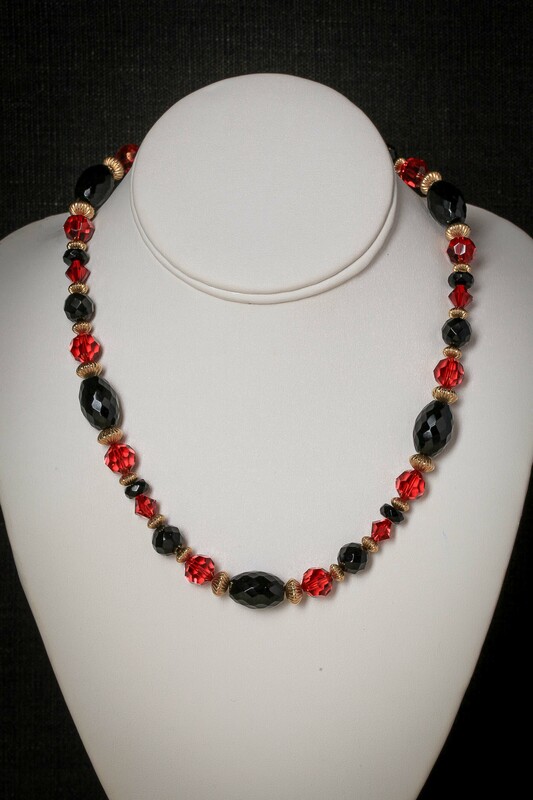 Garnets in classic deep red and rustic grossular green echo the greens, tans, and reds of the agate. 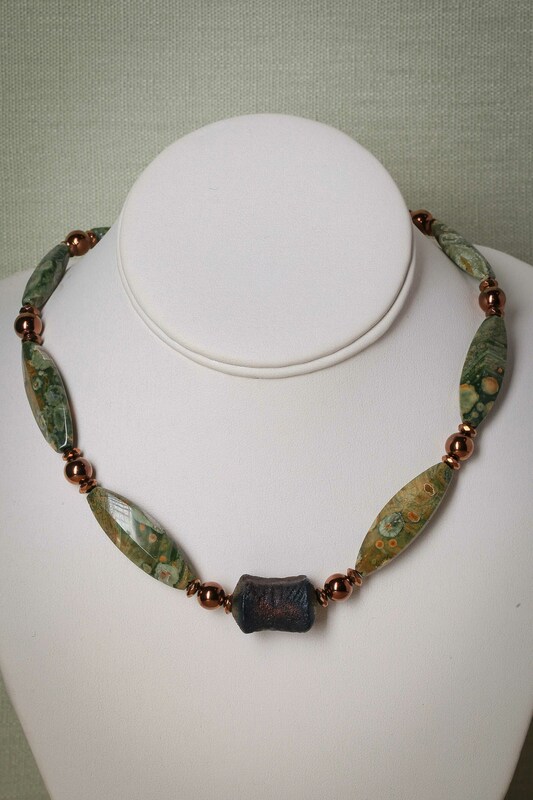 Sophisticated and earthy, wear this necklace on a day when you need to radiate complexity and persuade others that your unusual ideas are well-grounded. Black. Red. Gold. Colors of majesty, glamorous and irresistible. Talk about eye-catching! 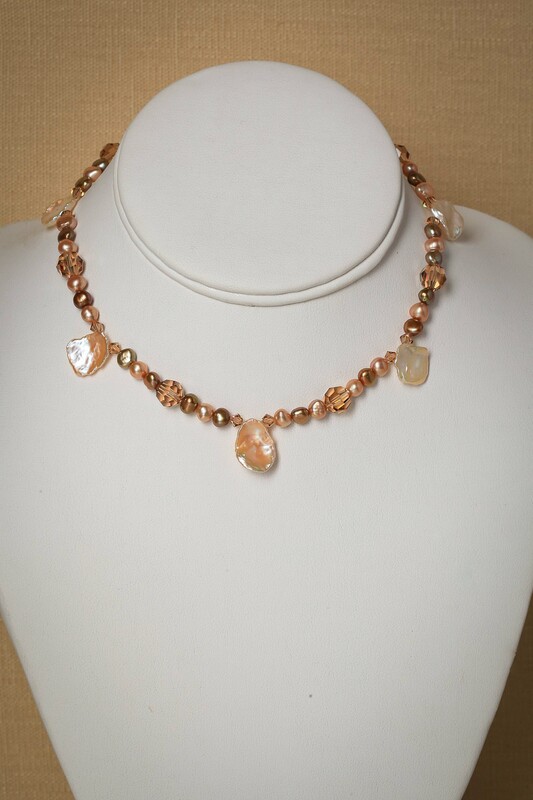 I sit at my work table, entranced by each rutilated quartz bead. Oh, those big warm brown rounds, sparkling with golden needles. Which playmates do they crave? Ah! They want the pop of hot orange carnelians, the shimmer of sunstones, the glitter of Swarovski. Luckily, I have them all. Luckily, you can have them too! 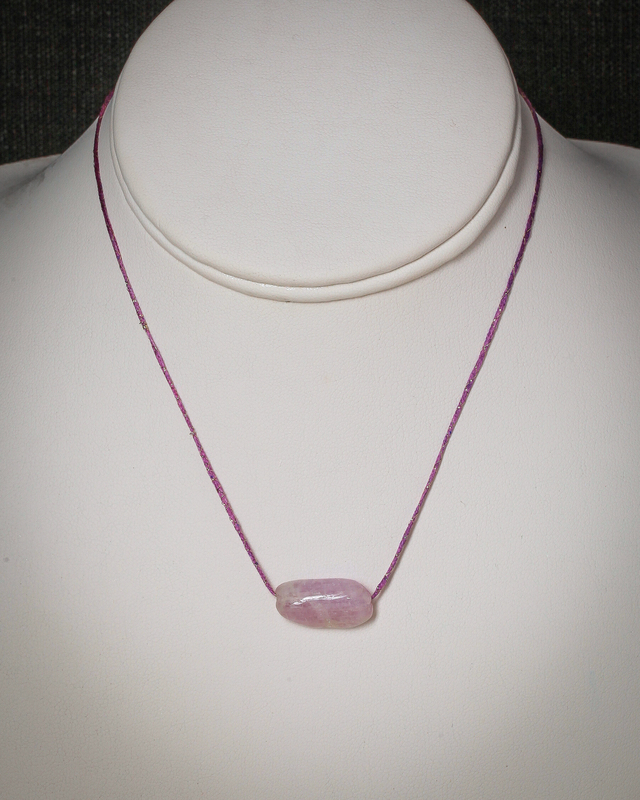 The lilac colored Kunzite bead shimmers with internal fractures. I could not resist combining it with Alchemy Yarn's Sparky in Radiant Orchid. The fiber is sleek silk wrapped with a thin golden strand. I want a house full of it, in all its amazing colors! The colors of the forest both soothe and stimulate. 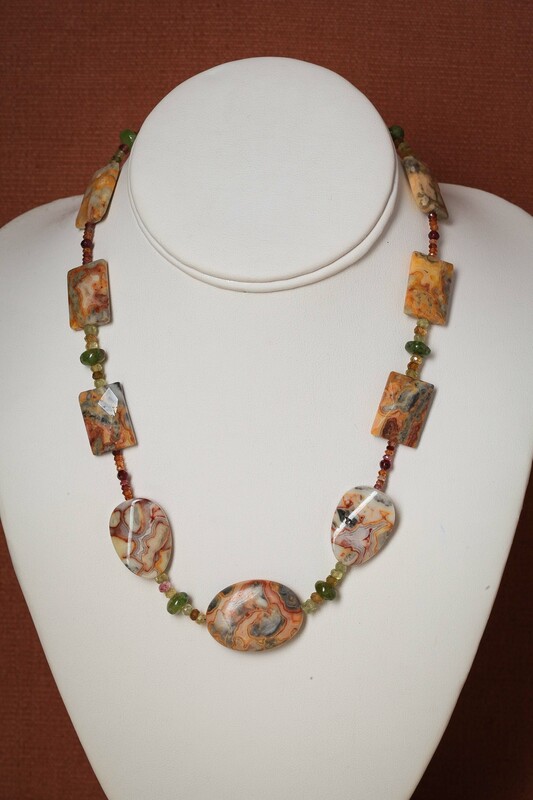 Feel serenely inspired by the rich greens and golds of the Rhyolite, the deep brown of the twice fired Raku. 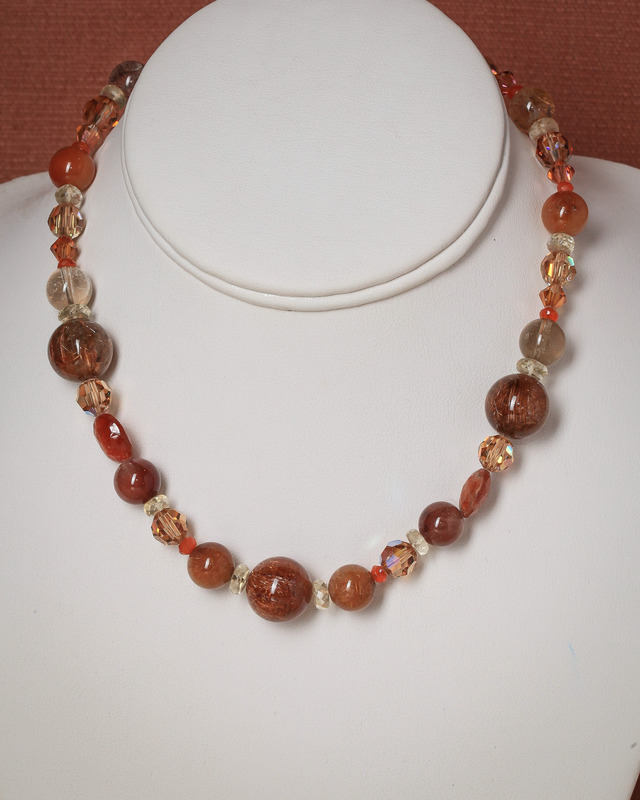 The titanium copper hematine beads and rondelles are man-made, but they all started in the earth. Wear this on a day when you need to impress and distract your boss.